I have some new stitching pics today! The first is for the Round Robin I'm in on the WWRR Yuku Board. This is Sophia's RR, she has sent it round the world once in 2008 and now it's travelling again. The theme is the great Teresa Wentzler and I was very excited to be stitching on this piece as I love TW's designs. 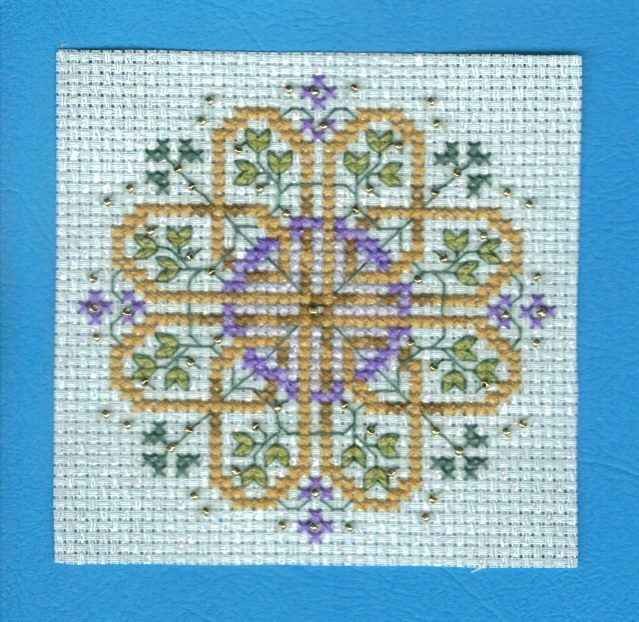 I chose a floral band from The English Cottage Sampler partly because there is one other UK stitcher on this piece and she chose from The English Garden Sampler and I thought they made a nice pair. 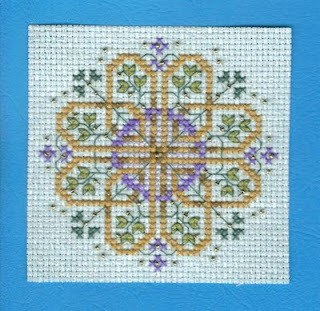 It is a more freeform band than some of the others but happily fitted into the 80 squares wide allowed in this sampler. I stitched it exactly as the pattern except for the top 4 rows which I mirrored the bottom four for symmetry. I also changed the edge leaves to single stitches where they would have gone over the edge. I've been super-careful with this one. It only comes out in the evening when the small one is in bed and I haven't been wearing my usual eye makeup. Why on earth not? you may well ask. Well, when it's getting late and you have "just one more row"itis and rub your eyes there is a risk that you will get black eyeshadow on the fabric! A risk I was not prepared to take! I had to frog the parts of the beige background crosses at least twice as they kept jumping one square over. Then the palest leaves (504) didn't look much different to the 503 so I looked at the thread in a better light and realised I had two skeins of 504 and one is lighter than the other. So I frogged them and redid them in the new skein. This is the woman who never frogs but recharts instead! This is a little piece I mailed off to Rachael to help raise money for the Cats Protection League. 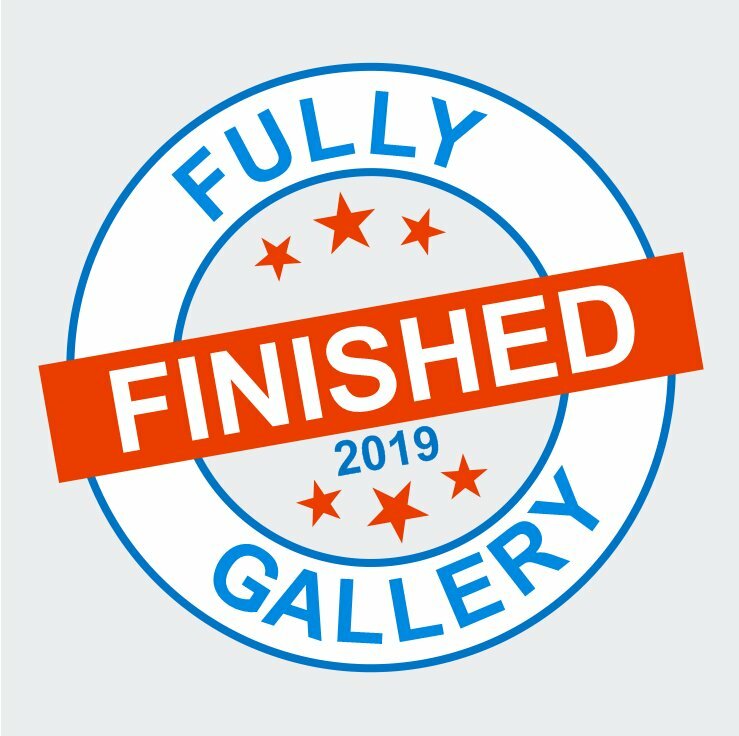 Hopefully it will be added to a quilt or cushion. 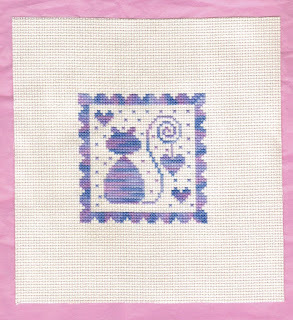 The design is by Tralala from SoCreaStitch and I stitched it in DMC 4215 a lovely variegated blue/lilac and pink. The two cats were bought with the money I got for serving 15 years with my old company. I also got my stash chest and a jacket (total spend £250) plus a party at the pub shared with a fellow "lifer" for 50 people. We were supposed to have a nice genteel buffet in the boardroom for 30 but the senior management wanted it too and as we refused to change our date they had no choice but to give us the money and send us to the pub instead! 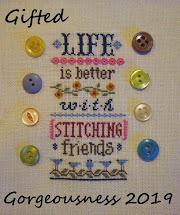 The final pic is a small freebie from The Stitcherhood blog which I found via the Needlecraft Haven Forum in their February challenge. I stitched it twice with a subtle difference. Now all I need to do is find some black ribbon with hearts or maybe some thick lace and decide how to frame it. I've been inducted into a Stitcherhood! Not the Lizzie*Kate one I've been following since it started 5 blogs ago but a new (to me) one. Now I always try to follow my followers in return, so when Nataly became my follower I popped over to her blog to return the favour. There I spotted her passing the Travelling Pattern onto Erin. So off I trot to follow Erin, comment on the TP post and it's coming to me now! 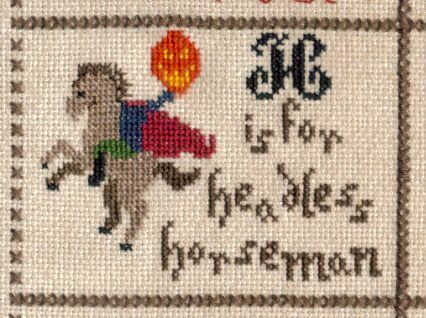 The pattern is by Shakespeare's Peddlar and is Count Your Blessings which is a great motto to live life by. So watch this spot. It will probably take a week to get here and a few days to get stitched depending on how much we are out and about each day then it will be off on it's travels again. It's always nice to find new blogs because I really don't follow enough (ha!) and I do try to leave a comment saying how/where I found them. This is a hint to my followers who haven't introduced themselves yet! I'd love to "meet" you via your blogs so leave a comment. Real World Question: when you're referring to something an online friend has said, what do you say "A friend of mine told me..." "An online friend ...", "one of my followers..."? Saying followers makes me feel like Brian in The Life of Brian! "She's not the Messiah!". The Dolls House in the last post was super-popular so I may be sending it on it's way to a new home. I've been watching my Follower's List grow so thought either 100 followers or my Birthday would make a good occasion for a Giveaway, whichever happens first. My Birthday is in September so it won't be long either way. Stitchingwise I'm working on a Round Robin for Sophia, it's a Teresa Wentzler band sampler and is GORGEOUS. 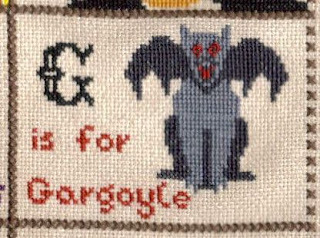 I'm also stitching I and J for the Dark Alphabet and have just completed a cat which has gone off to be included in a Cats Protection League raffle and a freebie for a new (to me) forum. This is the Needlecraft Haven. They have a monthly freebie challenge. Christine chooses a free chart from t'internet and each person stitches it then there is a big Reveal on the last Sunday of the month. July/August is ongoing so I have to wait til the end of August to show you. There are no photos again, so I must find something to show you. As the family link was so popular last time, here is the sampler I stitched for my Grandparents' 60th Wedding Anniversary. They have both passed away now so it has returned to me. It's currently in storage but comes out everytime someone asks what a particular Anniversary is. We've just celebrated Flowers. They had 60 years and "never a cross word" hahaha. Lots of bickering kept their minds agile! They used to spend alot of time arguing over who had owned each corner shop in each street, or the exact order of the names of a series of narrow paths called "The Scores" in our town. Some of which no longer existed. Finally a reminder of a special service this blog provides - contents pages for my favourite magazines to help you decide whether to look for them in your far-flung countries. 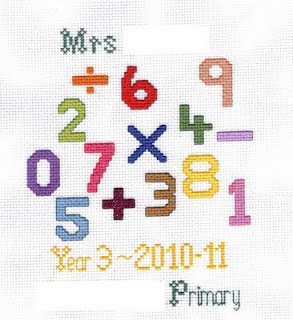 World Of Cross Stitch just added a little belatedly (oops). Look at the tabs at the top. I've been having a little framing session this weekend. I inherited some needlework pictures from my Great Aunt via my Mum. Great-Aunt Daisy passed away nearly 25 years ago with no children so her precious things were inherited by my Grandad (her brother) and my other Great Aunt. They were then passed onto the nieces, nephews and great nieces/nephews. I already have a cute set of playing cards in a leather case, a lovely brooch and now these two pictures which were stitched in the late 1930s. I reframed them but did not attempt to clean them. I was too worried I would make more of a mess! The edges are the dirtiest but the stitching is quite clean and the colours are still true and fairly unfaded compared to the back. 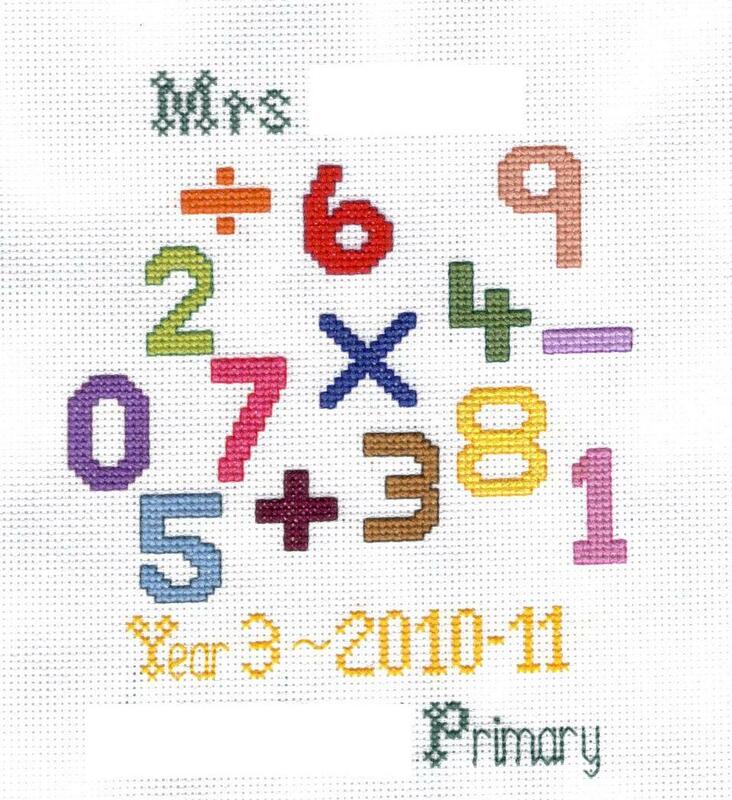 The stitches are a mixture of straight stitch, satin stitch, lazy daisy and loads of french knots. They are now hanging in my bedroom. BTW my brother and I decided if the collective term for brother/sisters is siblings then the term for nieces/nephews is niblings. 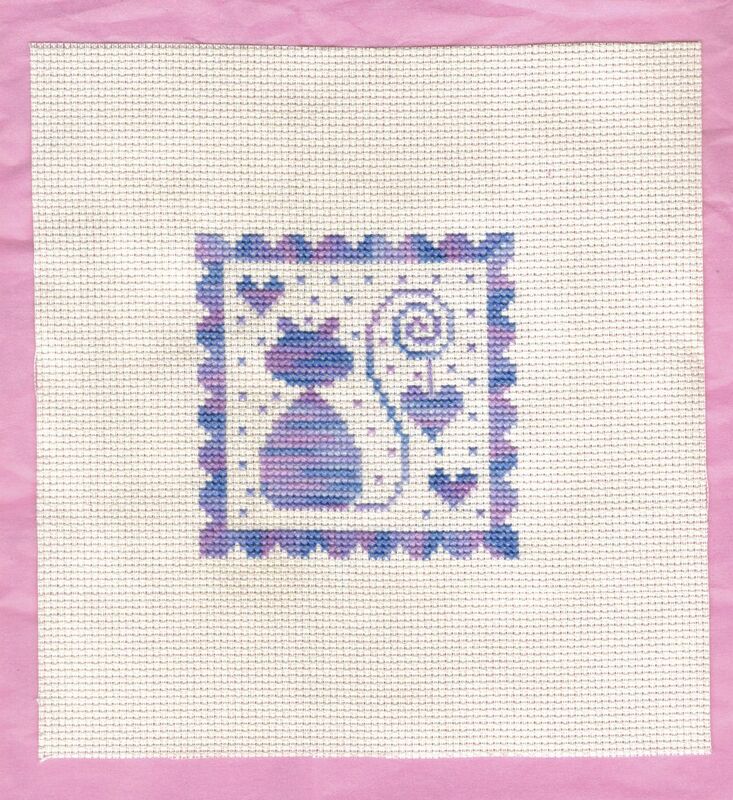 The next framed piece is a kit I bought many years ago and decided to stitch as a birth sampler during my last pregnancy convinced I was expecting a girl. The small boy appeared, and not so small at 9lbs 14.5oz!! So I finished it off with our initials and it's now hanging in the lounge while Celtic Christmas is having a rest after 12 years of display. This was great fun to stitch, I love all the little rooms. After that I finished off a Joan Elliot flower in a pot to match the previous JE flower in a pot. The frames were cover gifts from Cross Stitch Collection mag but I didn't like the pictures suggested so stitched these two JE designs from the free WOCS booklet - the best free gift EVER. In the evenings I've been stitching a RR from the WWRR Yuku board, my first ever RR. I sent my piece off and thanks for the Canadian postal strike it took 2 weeks to get there, while mine arrived from Australia in less than 1. It's very nerve-wracking stitching on someone else's piece especially as this one has been round the world once already and has some gorgeous work on it. 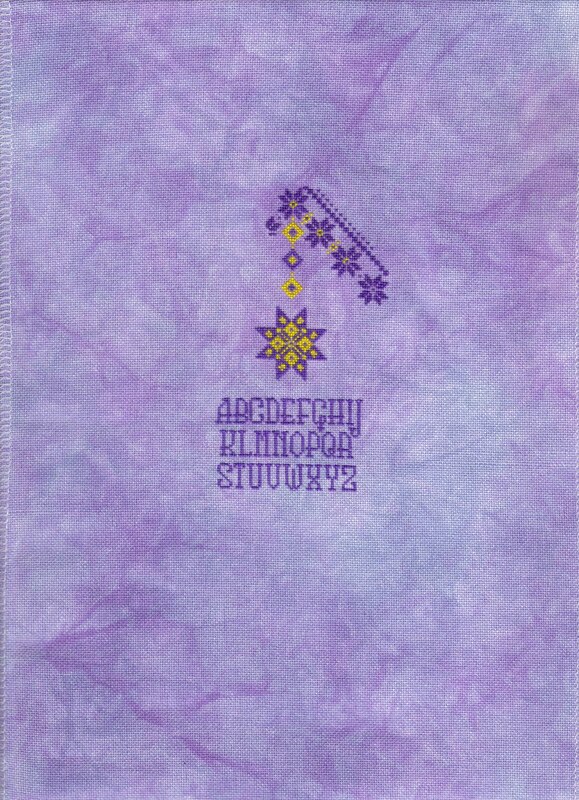 The theme for the RR is Band Samplers and this one is all Teresa Wentzler designs. Sophia has sent some borders for ideas but luckily I have two books of TW designs already and have chosen a great one (I think). I have been super careful to railroad every stitch, every end is tucked in extra neatly, frogged threads thrown away and NOT reused, my hands are scrubbed clean and the small boy is not allowed within 20 feet of it! Being a TW design there are 4 different blended colours already and I've only stitched 4 rows and some background lines! The WIPS on my stash chest were Bluebeard's Mermaid (the blue fabric was a BIG clue) and the Dark Alphabet (you could just see the chart under it). Congrats to Mouse for getting one point! Gabi aka the Lady of the Floss is having an amazing giveaway to celebrate her Blogaversary. 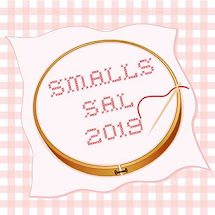 The prize is $100 to spend at Anita's Little Stitches, an online shop. And guess what? This is the very shop that sells the amazing scissors I love. So if you enter and if you win then you have to buy me scissors, OK, deal? 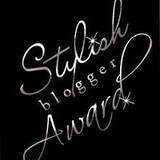 Part 2 of the Stylish Blogger Award - choose 15 blogs to pass the award on to. It seems like we all follow alot of the same blogs which is great as it feels like a real community with everyone knowing everyone else. I thought I'd pass my Award on to some of the less well-known blogs. I went through my list and chose people who really deserve a wider audience. 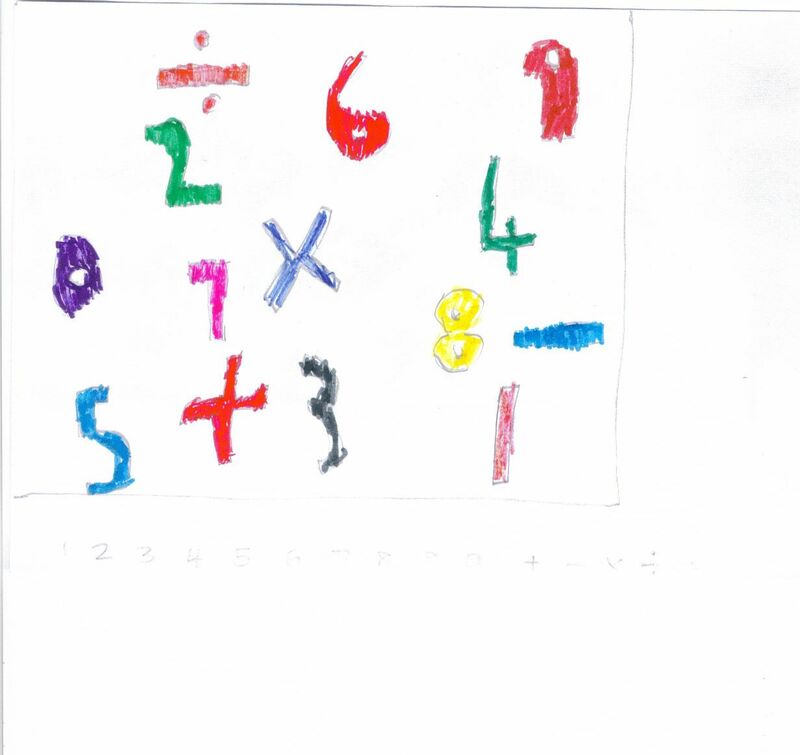 Already Forgotten by Valentina, stitches Mirabilias and crochets, she loves cats. Stitching in the City by Hannah, the city being London. 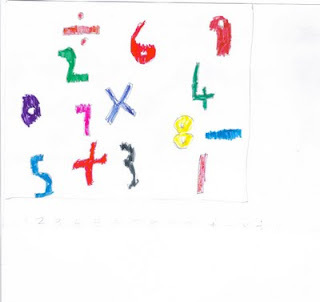 Hannah is new to blogging, follow her ambition to stitch her first Chatelaine this year! 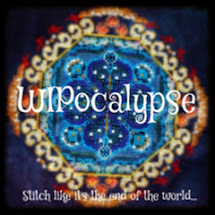 Stitchy Stitcher - by Eyani, Mirabilia, Joan Elliott, Dark Side of the Moon, what more need I say? This takes ages!! Finding all the blogs and links. Anne from Doll's Musings has awarded me The Stylish Blogger Award. Am I Stylish? I'm not sure, maybe my blog is, but any award is nice to have! I have to Thank Anne, say 7 things about me and pass the Award onto 15 bloggers. Some of my Earring Collection. The rest are kept in my jewellery cupboard. Yes I have a cupboard for my jewellery. These are my favourite and my best earrings that I wear most. They are displaying on cake cooling trays. The cakes I eat are already cool from the shop so I don't need to use them for their original purpose. This is the T-shirt from the first ever concert I went to. I love live music. I love loud music. My Mum let me go on a coach with 50 hairy rock fans on the grounds that the organiser had been 3 times before and had a proper job and was therefore considered quite respectable. I shan't say how old I was because then you'll all know! This is my rubble collection. The brick on the left is from the music venue which hubby used to run and where we got together. I was working for him and he is such a gentleman he insisted on walking me home every shift. No ulterior motive there at all. When his lease ended they sold the building and it was demolished. The one on the right is a genuine piece of The Berlin Wall. I went to see Roger Waters perform there and we all brought back chunks of historical rubble, see it has graffiti paint on it. This is my needlework book collection. They live in the kitchen so I have something interesting to read when I am cooking heating up food. (Tolkein and the Medieval manuscripts have sneaked in because you never know when you need to grab a quick look at them). This is my display shelf for my smalls. (small projects, not my underwear haha). I bought one in an "antique" shop but it was 5mm too small for all the frames so my Dad made me this one to match. The other one has ornaments on. This is my stash chest, under the stash clutter! Bonus points for anyone who can indentify the two WIPS visible on top of the chest. This was the last thing I bought myself. It was £3 and is very useful as well as decorative. I don't have time now to post 15 links to my 15 blogs so you will have to wait for part 2. Oh, the suspense! I have to go bath the small boy. He seems to be having a sugar-rush, he had yoghurt for afters which is full of sugar. It makes him giggle like a loon. As I was trying to get ahead of my teachers' stitching which must be finished by the end of term﻿, I'd got behind with the Dark Alphabet. So I had two squares this session. 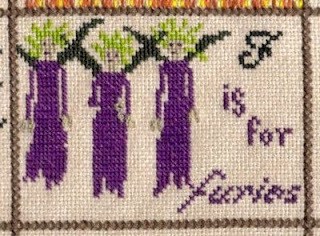 The first is F is for Furies, 3 women you do not want to meet on a dark night. According to Greek myths they were Alecto, Tisiphone and Magaera, the children of Gaia and Uranus. Now there are three names which must be due a revival, I've heard stranger ones than that recently! My Furies are stitched in the recommended colours except for the dresses. I love the effect that tweeding produces but it's impossible with 1over 1. So for the dresses I stitched the bottom /// with 552 and the top \\\ with 550. It makes a nice knitted effect, especially as my over 1 rows have a "rib" when I stitch horizontally (it's noticeable on the C square too). So my Furies are Fashionable too in their knitted tube dresses! I have just noticed that I haven't finished my gargoyle's left leg! I must stop blogging and go finish it at once. How strange. Also it is very hard to type with a wriggly 2 year old on your lap so you can only use one hand pecking the keys one at a time. With two hands I can use 2 fingers and it's much quicker! I have to share this with you all too - it's from Freddy's Mama of the "Stitchin' Addiction" blog, she saw it somewhere else and had to share too. I'm sure you'll all agree when you read it. And here is the finished Gargoyle with a completed left leg! I stopped stitching late on evening and when I picked it up the next night I started on the light grey not noticing the unfinished leg!